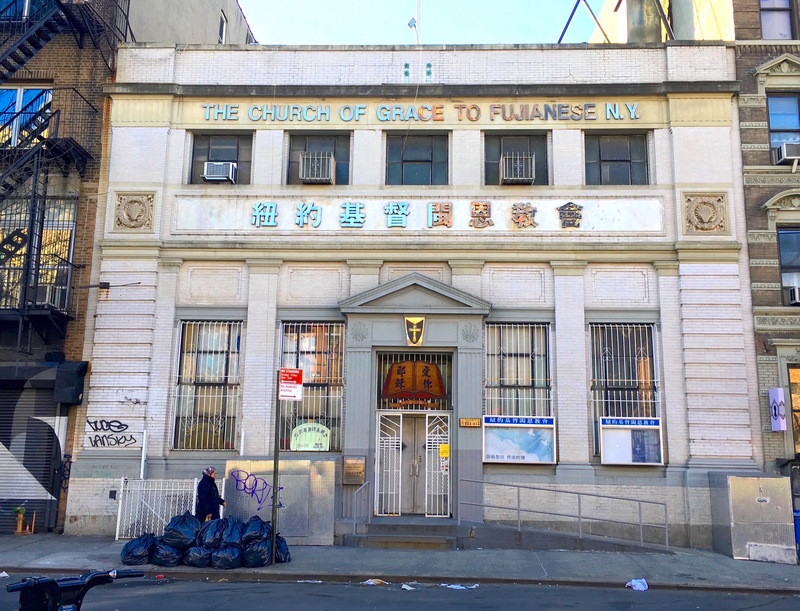 The Church of Grace to Fujianese, at 133 Allen Street, looks like lots of other storefront churches in New York City. The congregation is housed in a slightly grimy re-purposed building. 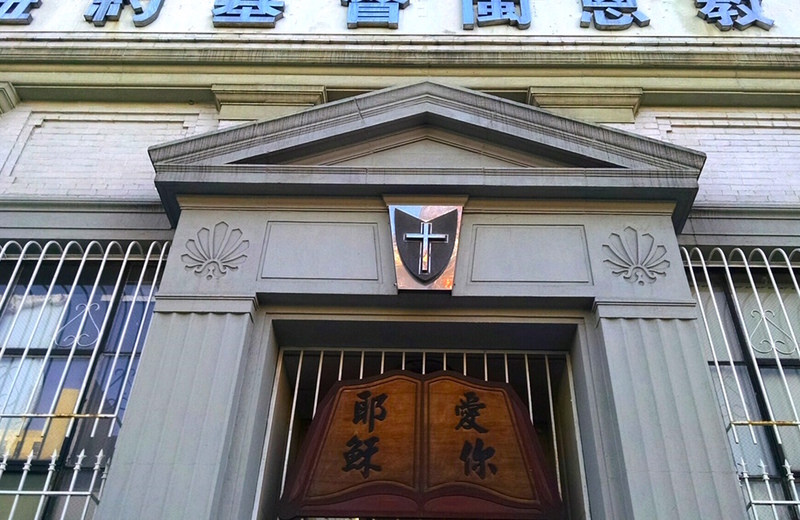 Window guards line the ground floor, a cross is affixed above the entrance, and signs are emblazoned with the church name in two languages. 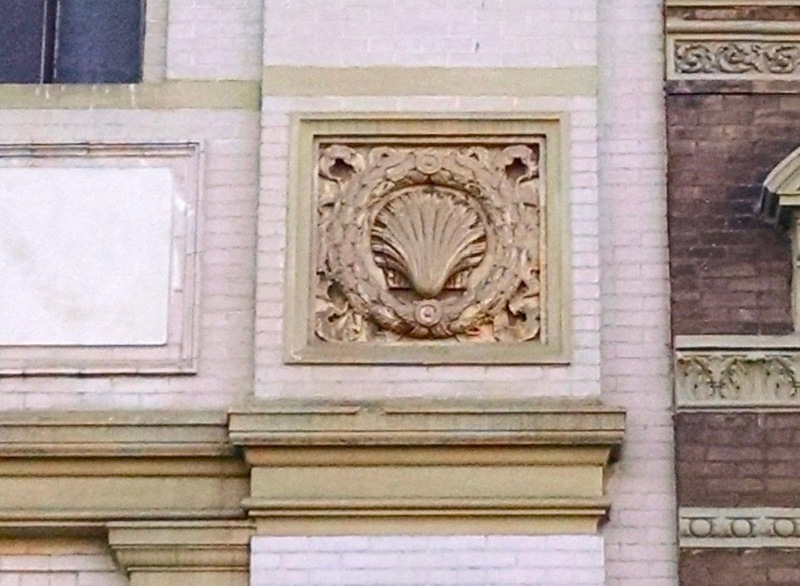 But there’s something else on the facade—they look like scallop shells. 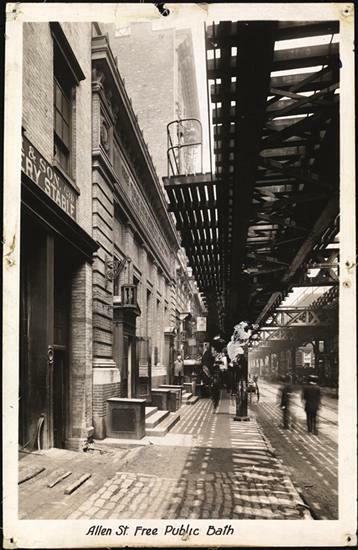 These sea images are a reminder that from 1905 to 1975, this was the Municipal Bath House at Allen Street, blocked off by the elevated train in its first decades. The bathhouse opened amid a wave of public baths building in the city’s slums, giving tenement dwellers a place to wash up in an era when having a bathroom in your apartment was hardly a given. Their was another purpose for these public bathhouses: to offer moral uplift. With this in mind, the designers of the Allen Street baths built facilities that provided access to light and air. “With large arched windows in the waiting room and glass skylights punctuating the roof, York & Sawyer bathhouses were designed to maximize sunlight—a rare building strategy in the slums—to help uplift the bather morally and hygienically,” states the Tenement Museum website. The baths were immensely popular in the early 20th century, as The Sun noted on a July day in 1908. Of all the public baths, Allen Street stayed open the longest—then fell victim to the city fiscal crisis in the 1970s, according to the Tenement Museum. This entry was posted on March 19, 2018 at 5:15 am and is filed under Houses of worship, Lower East Side. You can follow any responses to this entry through the RSS 2.0 feed. You can leave a response, or trackback from your own site. Oh, for the days when “public” was not a dirty word and public buildings were built to inspire. There aren’t even public telephones now because everyone is expected to own their own. Hoping for a public revival. Those are scallop shells, not clam shells. The Russian Baths are on my to-do list…I trust they’ll be around for another 100 years! Let’s hope! The owners have changed. Lol… They would have to I suppose to avoid resembling the Oscar Wilde novel. These bath houses were a great idea when started. It was like a resort for poor people. Are these bath houses the same ones that gay men frequented in the seventies and eighties? Wasn’t a bath house the origin of the spread of Aids? Just trying to complete the bath house story. Research Saint Marks Baths Tom (St.Marks between 2nd Ave & Astor Place). I can’t remember the history. Ephemeral may have a post on it. (I would do it for you – but as I type this I am painting my nails w/ only half of them done!). The Russian baths on E.10th were full of Orthodox people (probably both Christian & Jewish) so the answer there would be ‘No’. But it’s a reasonable assumption that some municipal men’s public baths later became Gay baths. It’s an interesting question. Perhaps Bette Midler reads Ephemeral & will write in under an alias screen name; since she performed at them in SF! *AIDS began many years before initially thought Tom. Researchers believe it began in Africa when people slaughtered monkeys for food; cutting their hands in the process & thus getting the virus from primates. Sexually transmitted AIDS in the US is now believed to have started much earlier than 1980/81; when it began to be documented. And people got together outside of men’s bath houses. Public baths were very badly needed in New York because the “old-law tenements” often lacked plumbing. That made epidemics and diseases major issues. The solution was to get rid of the “old-law tenements” and even the “model tenements” that replaced them, with apartment buildings and town houses that had real plumbing. David ~ The c. 1920 tenement building (studio apts only like a rooming house) I lived in that originally only had a ‘water closet’ (toilet) in the hallway – had full baths installed in the 40s or early 50s. (My guess from the fixtures; as there was a modern tub vs. claw foot tub – but w/ an older pedestal sink). The bricked up & painted over door was still visible in the hallway. I suspect this also explains all the bathtubs in kitchens. I hope somebody is photographing these – now that every LES & Hells Kitchen etc. tenement walk up building is being renovated beyond recognition. Then you know what I’m talking about…my grandparents remember the single toilet in the hall, which the whole hall used. You could smell it all the time. Lol! They may not all be a thing of the past David. The last time I saw one was 1992. At a party my brother took me to on the LES. I left the City after that. (Lol – but not *because* of that). PS David: If we’re going to rudely hijack this thread to discuss toilets any further – perhaps we should add a trigger warning.